Yup, I'm stealing from P.T. Barnum. Sucker and Stud8 player are interchangeable terms. I don't think there is a flavor of poker that attracts worse players. Write down this term: scoop. Belay that. Capitalize it and turn on bold and underline. SCOOP! A chop is sharing the pot instead of winning both sides; scooping is winning both sides. You won't make money if you are always playing for half the pot. You will chop a lot; but that's just wheel spinning. Even pots that start as family pots are going to lose participants. The mistake is repeated time and again as picture card are routinely used to call the door. The door is the first round of betting with the single card showing. You want to be playing babies. Babies are between ace and eight. The best are single suited. Second best is with an ace. Third comes consecutive babies. The only thing better than that is rolled up – starting with three of a kind. With just this info you can play better than 80% of your opponents. We talked about bricks and tombstones yesterday. If anything, this happening is worse at S8. The idea is to scoop. Bricks affect both hands so … twice as bad. I also mentioned that the Hold'em mentality creates suffering; but, if you tend toward being a rock, you may have found a new home. Stud8 is a game of fewer hands and easy folds when it is played well. Bluffing is possible but don't even think about it as you learn your way around. Playing well here lowers variance dramatically. In the stud family, variance in descending order goes: RAZZ, StudHi, Stud8b. The tables are normally full of chasers. Just because they occasionally hit, don't rush to open your game up. It is a temptation that you must resist. The bring in is a portion of the small bet. It looks cheap. It gets the guy with good looking crap to call. It gets some to complete. Completing is moving it up to the small bet – a raise. They are normally betting an unmade hand. Again, the place to extract value is with made hands. As you are getting your sea lags avoid it – even rolled up or with buried AA and a baby showing. These are nice hands to speculate with. At higher limits and with more knowledge, that isn't always the right thing but, for here and now, relax and let the cards come to you. Deceptive hands are a joy but not something to try to make happen a lot as a novice. Deception is golden when the other guy is obviously chasing high and you've a high hand that looks like it a low. They can happen in a lot of different ways but let them come to you instead if seeking them. If you get to 5th street, the bet become the full bet. When you call at that street, you should have a hand and outs that will take you to the river. This is the street to learn the weak players and chasers. This is a big note taking time. Is S8b your game? You'll want to be a near rock or have comfort playing 08 to make this your first stud choice. If you have that discipline, go for it. It is a fun game in the little tournament I play because you can play a bit stupid. (pseudo advanced play) Because of the progressive structure, you can be a bit of a donk and succeed. In ring, this is a game of discipline. Meet a stupid hand. It was a stupid hand for every player – moi included. It was won by a stupid hand. My only saving grace was getting out when the big bet hit. What did I have? A small hidden pair and two suits. In a ring situation it is a quick fold, if you aren't a Wizard of Oz scarecrow. I shouldn't have called 4th street – making matters even worse. I did have enough gray matter left functioning to fold when the big bet hit. The AA guy is a loose cannon that loves to complete. The TT player is an every hand chaser. The one 'honest' hand needs help to make his 8 low work. In this instance, AA did complete and I stupidly called – looking for lightning in a bottle, I guess. With the K showing, the guy calling the completion with a Q up can only defend his play with the read on the AA guy that all of us had. Iffy at best. Regardless of what K-up had, he should have also known that the guy wasn't going to check the next street. He hangs in there far to long before getting religion. The honest hand really gets a brick. OK, it is a pair. But 8's? He hangs around looking for the same bottled lightning I was after but calling on 5th is basically saying I am in to the bitter end. TT is a player you love populating your environment. That weak pair – the dregs of broadway – never shows signs of improvement. Not a card from start to finish improves the hand. And both tombstones hit — I had one early and the other came late. She's really chasing one out with every big bet until finally it is zero outs. Success came to 8's up. Certainly an embarrassing win. Not one hand was played well. It was 40-80 and I needed to see something happen with my below average stack. I came; I saw; I failed. While this is a tournament hand with vague reasoning for play, this hand is too typical in tournaments but plays out time and again at ring. 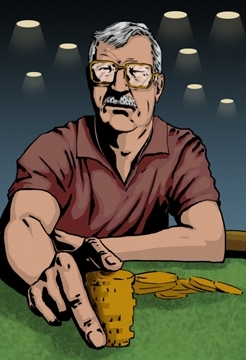 If you understand poker and learn this game properly, it should serve you profitably.